Energy is an important element of today’s society whose demand has risen over the last years with population growth and economic development, among other issues, which can compromise the several commitments made in order to reduce Greenhouse Gas Emissions (GEE). The reduction of energy consumption is, therefore, necessary to reach sustainability, with buildings accounting for about 30-45 percent of the final energy consumed in most countries, representing an opportunity to increase energy efficiency (Santos et al, 2018). In the last years, some improvements were made regarding electrical household appliances by establishing some measures, like the European Directive 2010/30/EU, and, more recently, Regulation (EU) 2017/1369 of 4 July 2017 of the European Parliament and of the Council, which established mandatory labeling by classifying these appliances by their consumption as well as other issues, promoting energy services cost reduction and their equivalent CO2 emissions. 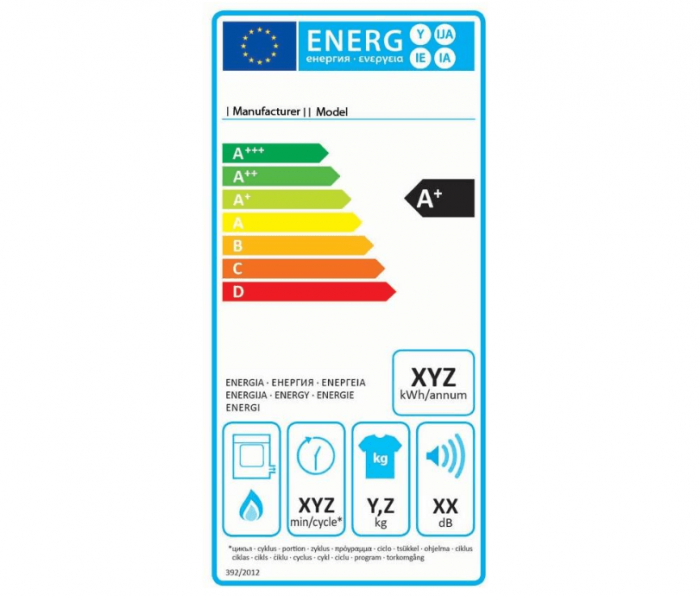 In Figure 1, we present an example of an energy label regarding a washing machine appliance. This is relevant to inform the consumer about important issues, specifically regarding each appliance (e.g. 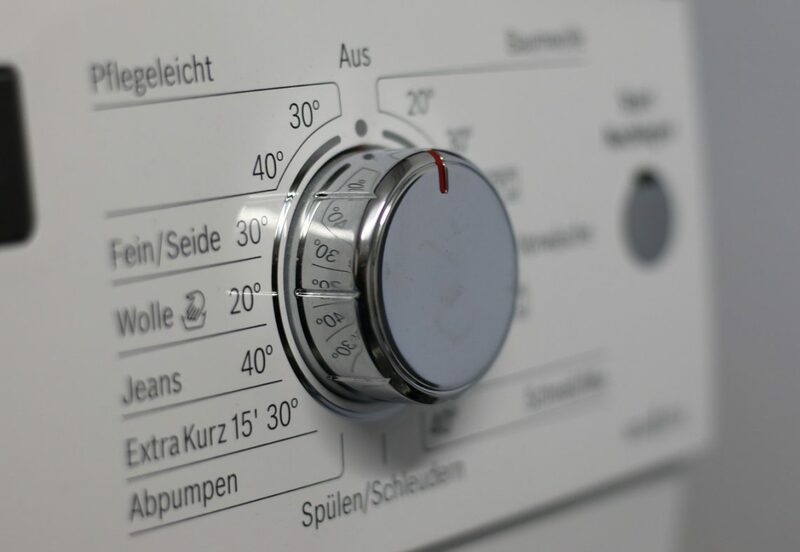 energy consumption, noise, capacity in liters (fridge), clothing capacity (washing machine), among others), promoting an efficient use of each appliance adjusted to consumer needs. Besides an eventual existence of a trade-off between the initial investment and the electric energy consumption during the appliance life cycle usage, all this available information leads to a several trade-offs, which brings some difficulties regarding what choice to carry out in order to get the best appliance suitable to the consumer’s needs. These needs can be supported by some criteria and can be dependent on issues like the number of occupants, air conditioner capacity (when applied), etc. 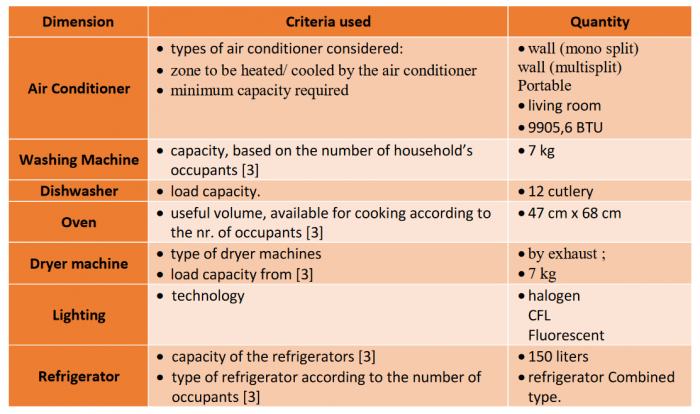 One example of such adopted criteria is presented in Table 1, considering 4 occupants. Based on what was referred to before and given the many options available on the market, it’s difficult to analyze the best solution to adopt in order to satisfy the individual needs of each consumer. The problem increases when we know that each appliance has its own distinct characteristics which vary by brand and model to buy, making the cost-benefit ratio very different, sometimes making it difficult to analyze given the different equipment life cycles and energy consumption, among other issues. In this sense, and given the different options available on the market regarding dimension, the number of possible combinations could be substantially bigger with the increase of the number of dimensions considered for the problem (e.g. lighting, clothes dryer machines, electric ovens, etc. ), as well as the number of options/dimension available on the market, leading therefore to the existence of several trade-offs between them. Therefore, if we consider a consumer who wishes to acquire different types of household appliances, he will have to deal with a problem of a combinatorial nature (Figure 2), which can be tackled by using optimization techniques. Combined with the criteria referred to before, it will lead to an approach (which is currently being developed) that allows the consumer’s decisions to be supported by sustainable solutions that incorporates economic, social, and environment concerns, which will be the dimensions to be maximized, in order to improve the consumer’s overall well-being. In Figure 3, we present an approach that allows the consumer to get energy-efficient solutions from the market by maximizing the economic dimension. According to Figure 3, a pre-selection of a set of appliances was performed according to the energy services needed by the consumer, as well as the criteria established according to the consumer’s individual needs. Furthermore, for each potential solution/option, we calculated the corresponding savings (consumption and initial investment) regarding the appliance’s life cycle, which is linked to the consumer’s usage phase as well as its usage profile. On Table 2, we considered an example regarding the case study considered here. By achieving the corresponding savings related to each option and regarding each energy service considered, optimization is then performed by using Evolutionary Algorithms. 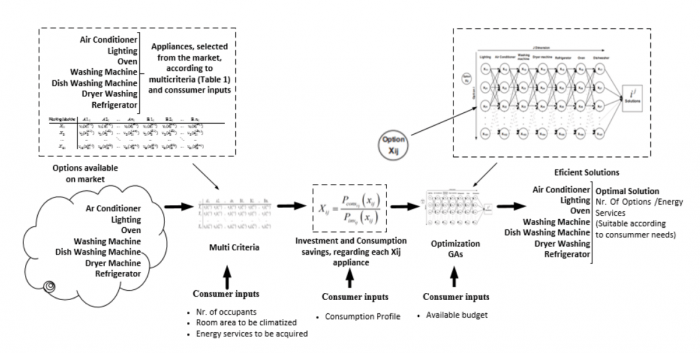 The performed optimization considers the consumer’s available budget as a constraint to be included, since each optimal solution to be achieved is compared to each energy service needed by the consumer, although knowing there is a limited budget to acquire them. In Table 3, we present an example of a feasible solution obtained by GAs (it was considered using a budget constraint scenario of 2600 Euros). It is also presented the savings in terms of CO2 emissions regarding the choice of the efficient solution compared with the standard (inefficient) one (approximated values). An emission factor was used as a carbon footprint indicator to calculate CO2 savings. According to Table VIII, if the consumer opts for the efficient solution, he can save up to € 1726,16 (€ 2100,82 -374.66), thus contributing to a reduction of about 1457,97 kg of CO2 for a time horizon of 10 years, according to the life cycle considered in this work. The next step in this approach is to incorporate the remaining dimensions of sustainability (environment and social), which are currently being developed. However, by maximizing the economic savings (regarding each energy service to be considered) it was possible to reduce energy consumption as well as CO2 emissions, promoting energy efficiency regarding each optimal solution achieved, and consideringing at the same time the consumer’s needs, including the consumer’s available budget. In conclusion, we presented a preliminary approach to provide sustainable solutions (electrical household appliances) from the market to a household consumer, satisfying both different needs pre-selected according to a set of specific criteria regarding each type of energy service/electrical appliance to be acquired by the consumer. This approach, and at this development stage, allows us to promote energy efficiency by providing the consumer with solutions from the market that allows to achieve not only energy savings, but also CO2 savings during the appliance life cycle (usage phase). The reliability of using Evolutionary Algorithms (Genetic Algorithms) in this approach was assessed in previous work, and its application is related with some of its main advantages, which, in this case, is the possibility to provide several and different optimal solutions to the consumer as well as its reduced computation time. Other dimensions could be explored in further work, such the electronic equipment or even a future application applied to an industrial context, which could promote energy consumption, investment, and CO2 savings from a set of efficient equipment. These findings are described in the article entitled Evolutionary algorithms on reducing energy consumption in buildings: An approach to provide smart and efficiency choices, considering the rebound effect, recently published in the journal Computers & Industrial Engineering (Computers & Industrial Engineering 126 (2018) 729-755). This work was conducted by Ricardo S. Santos from the University of Aveiro, J.C.O. Matias from the University of Aveiro and University of Beira Interior, Antonio Abreu from the Instituto Politécnico de Lisboa and Universidade Nova de Lisboa, and Francisco Reis from the Instituto Politécnico de Lisboa. 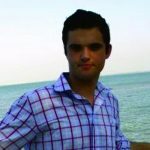 Ricardo Simões Santos attends the Doctoral Program in Industrial Engineering and Management at the University of Aveiro, where he is also a member of the research unit on Competitiveness, Governance and Public Policy (GOVCOPP). He has previously completed the cycle of Advanced Studies Program in Sustainable Energy Systems, from MIT Portugal Program, between Lisbon University (ISEG/IST) and Massachusetts Institute of Technology (MIT). Antonio Abreu is an adjunct professor in the Departamento de Engenharia Mecânica, Instituto Politécnico de Lisboa in Lisbon, Portugal.